We can no longer leave Dawson's puzzles out for display because Brady destroys them and tried to eat the pieces. 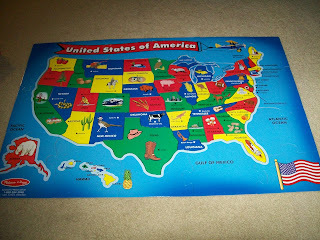 :-) So after Dawson put together his big states puzzle he wanted to take a picture of it before we put it away. Oh, and so far he knows 32 states!!! Just 18 more to go!